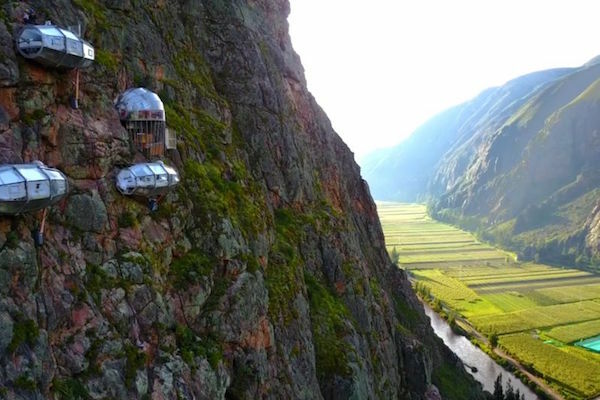 Sleep in a glass pod on the edge of a mountain overlooking the Sacred Valley for a night. 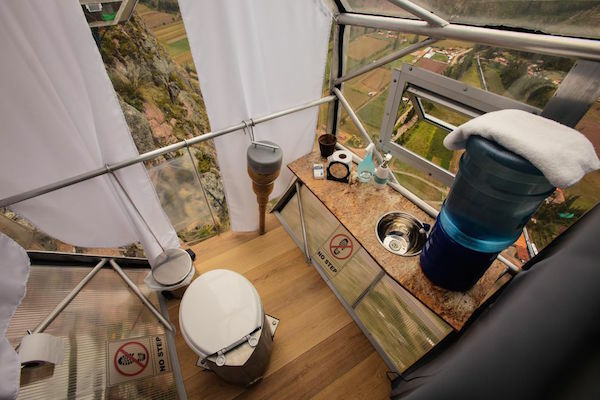 Dubbed as the million-star hotel, the Skylodge Adventure Suites promises one of the most unique and memorable night’s sleep of your life. 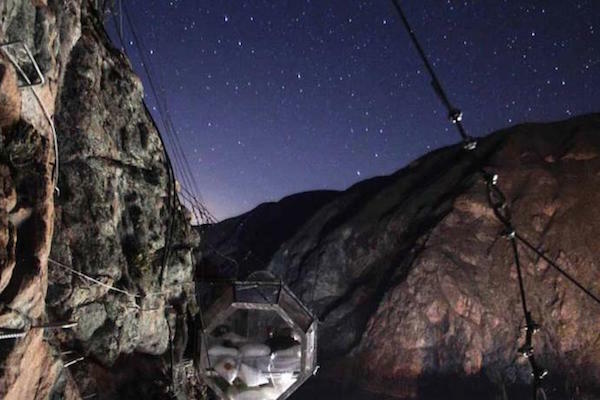 To reach the glass sleep pods, which are perched on a cliffside, you must either climb about 500m using via ferrata or you can hike up mountain paths. And to descend the next day you will take six zip-lines, whizzing down the mountain at ease. The adventure begins in the late afternoon, at about 4pm, and it will take about 1.5 hours to reach your bed! When we spent the night here (in the name of research!) we opted to take the via ferrata route. Safety was top notch and we were kitted out with a helmet and harness which keeps you connected to the iron ropes leading up to the Skylodge. Via ferrata is Italian for ‘iron path’ and you make the ascent beside a steel cable which runs along the route and is periodically (every 1 to 10 metres) fixed to the rock. You secure yourself to the cable, limiting any fall and must move your own harness cables onto the next section of iron cable after every rock fixture. There are lots of iron rungs along the way to help you, although some parts you will use the rocks to grip. 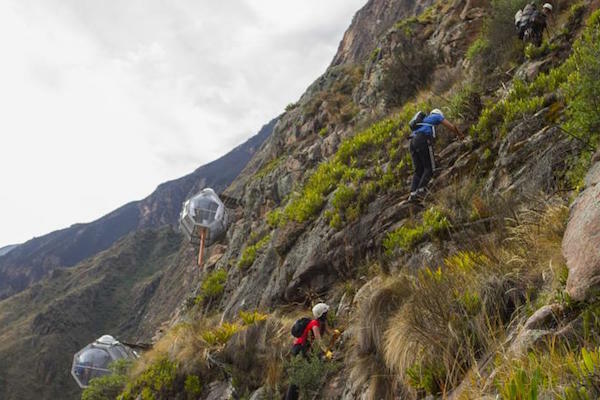 If you are fit the climb is not too physically demanding (children as young as 7 years-old are allowed to do it) but mentally it can be quite challenging, especially if you are afraid of heights! 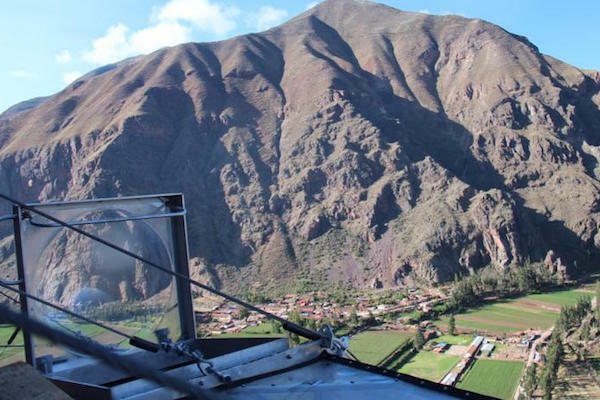 We recommend arriving in the Sacred Valley the day before to acclimatise but it is not so high, at about 2,800m. The hiking alternative is said to be quite strenuous but some people prefer it as it does not feel so daunting as scaling the rock face. 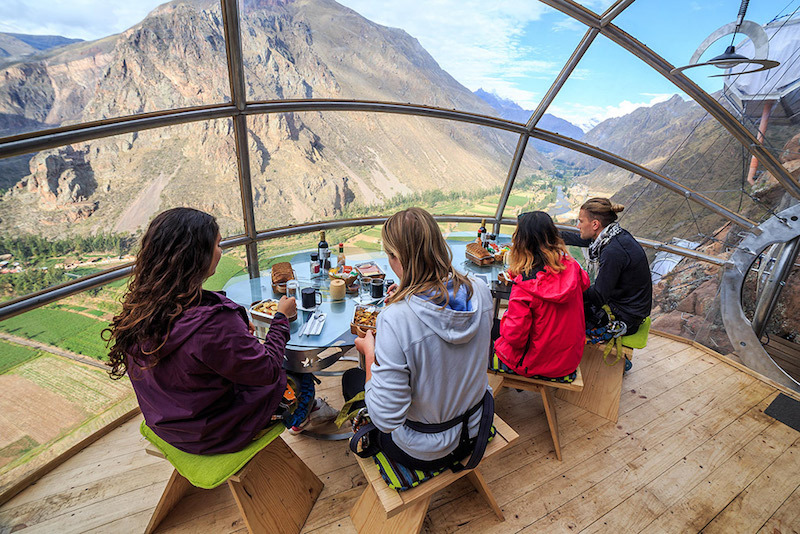 You reach the top just in time for dinner, which is served in a big glass-dining-pod where you will dine with your fellow climbers together. If you think you had it tough, spare a thought for the guide that carried your food up the mountain - not to mention the bottles of wine! The food is tasty and thoughtfully prepared, we enjoyed a three-course meal that included soup, a hot main course of sun-dried tomato and chicken with quinoa that was served with salad, and we even had a chocolate brownie for desert. Meals change daily but are of a high standard and are served with small bottle of wine per person! 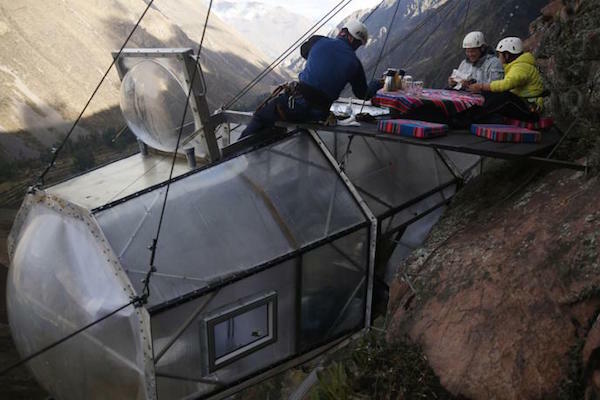 But as you have to climb to your sleeping pods from the dining salon they give you one to share per couple at dinner and the other to enjoy in your pod - a wise move! The sleeping pods are fantastic and spacious. They can actually sleep up to four people but it would be rather tight with a family of four in one pod! The beds are extremely comfortable (some of the best of the trip in fact!) 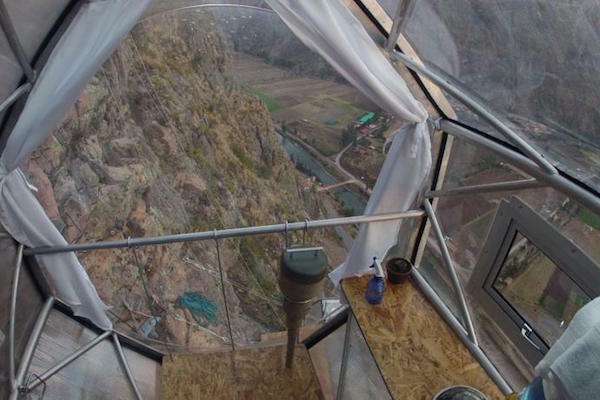 and you can pull back the white drapes from the ceiling and sides to reveal completely glass walls to gaze at the stars at night or the sparkling valley below you. The pods even have thermos flasks with a tea selection should you want a cuppa in the morning before breakfast. The toilet is impressive given the circumstances and in a separate zipper-section of the pod. There is no shower but there is a basin and fresh filtered water which can be used for a light wash as well as drinking water. In the morning, before climbing back to the dining pod for breakfast, one of the guides will come and check your safety equipment is on okay. Breakfast was another hearty affair with a huge bowl of fresh fruit, homemade granola and eggs on request. 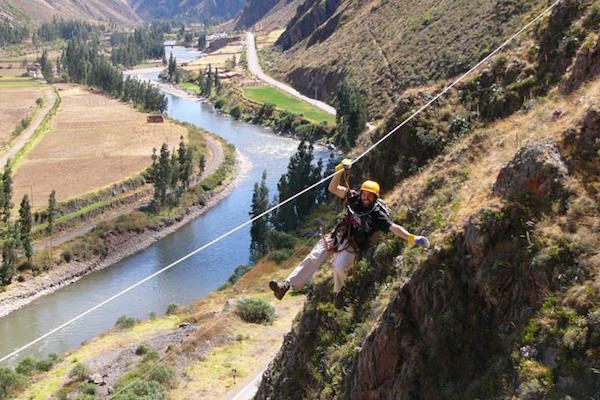 The zip-lining down is great fun and involves a little bit more climbing before making the descent. The guides will talk you through everything and if you are very scared, you can fly with the guide! 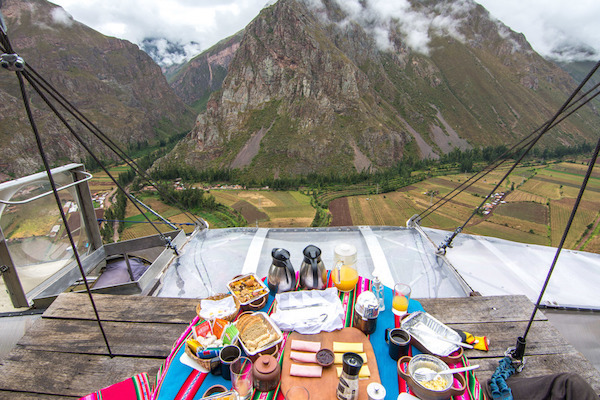 All in all, the Skylodge is once-in-a-lifetime remarkable experience that we think is well worth the somewhat hefty price tag. It is worth noting it is normally booked up at least six months in advance.